An Assistant Team Leader provides support to the management by overseeing the operations of the business. Their main task is to supervise the staff and delegate the works given by the Team leader, they oversee and assist the employees in completing the project and handle the paperwork, and they also participate in the recruiting process and help the team leader in report generation. An Assistant Team Leader makes sure that employees complete the daily responsibilities assigned to them. 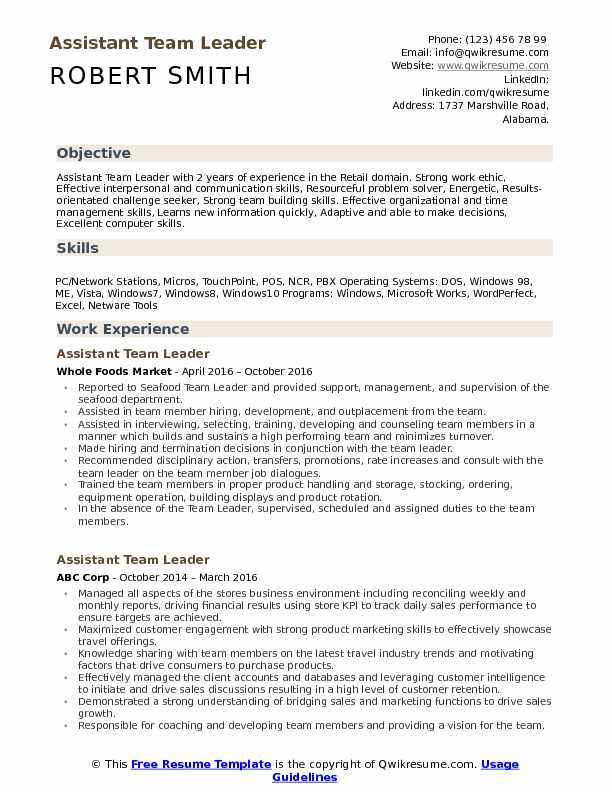 The most sought-after skills that highlight an Assistant Team Leader Resume are supervision, Good PC skills mainly in MS Office, in-depth knowledge of employees work schedule and good time management capacity. Even though a High School Diploma with training in human resource, business, management, and computing is regarded as the minimum qualification, candidates with a degree in Business Administration or management do not hesitate to take this line of operation. 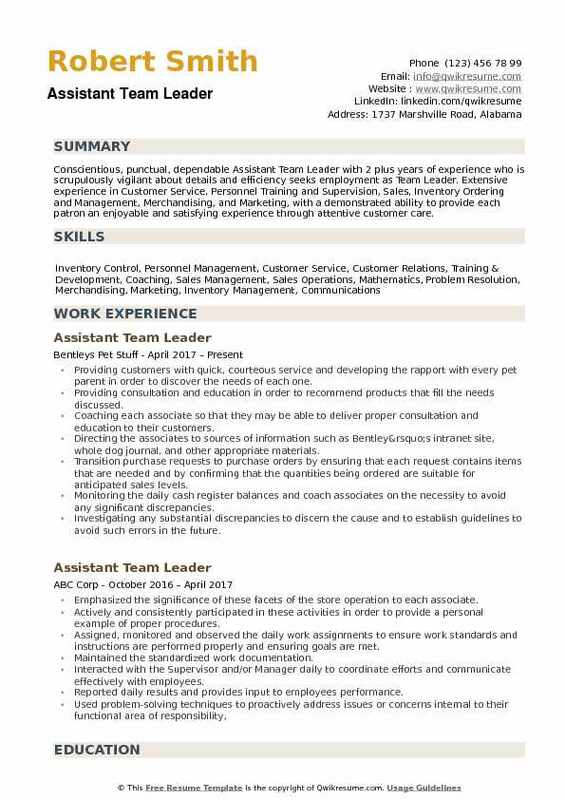 Objective : Assistant Team Leader with 2 years of experience in the Retail domain. Strong work ethic, Effective interpersonal and communication skills, Resourceful problem solver, Energetic, Results-orientated challenge seeker, Strong team building skills. Effective organizational and time management skills, Learns new information quickly, Adaptive and able to make decisions, Excellent computer skills. 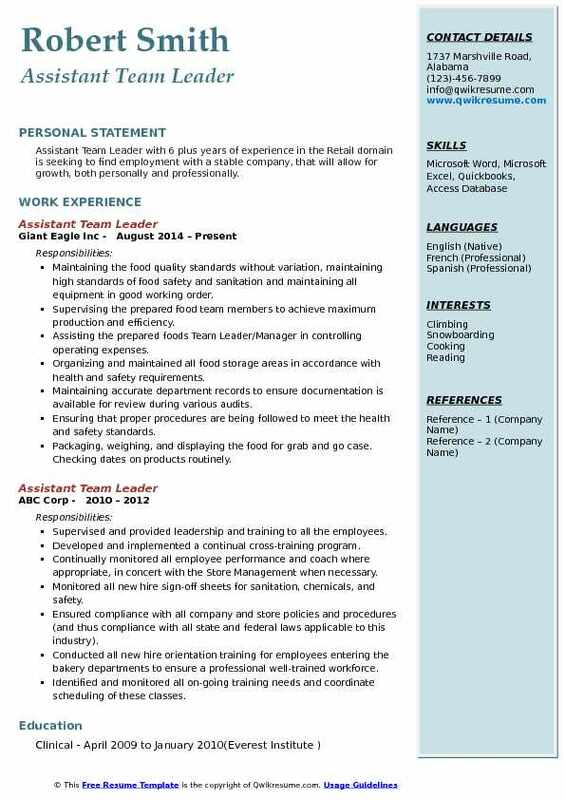 Reported to Seafood Team Leader and provided support, management, and supervision of the seafood department. 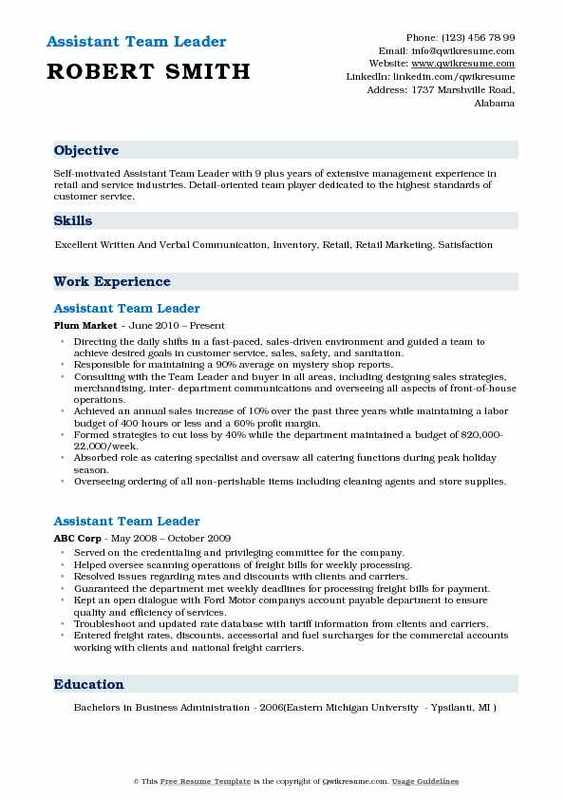 Assisted in team member hiring, development, and outplacement from the team. Assisted in interviewing, selecting, training, developing and counseling team members in a manner which builds and sustains a high performing team and minimizes turnover. 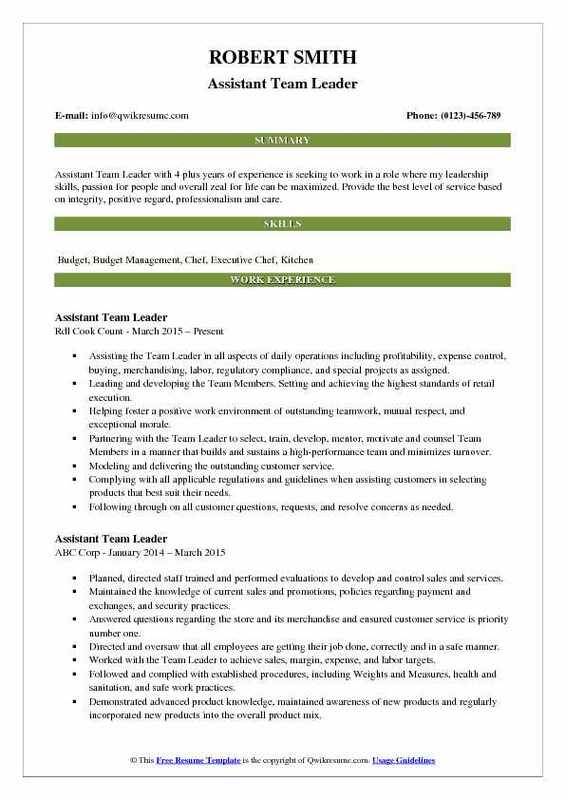 Made hiring and termination decisions in conjunction with the team leader. Recommended disciplinary action, transfers, promotions, rate increases and consult with the team leader on the team member job dialogues. Trained the team members in proper product handling and storage, stocking, ordering, equipment operation, building displays and product rotation. In the absence of the Team Leader, supervised, scheduled and assigned duties to the team members. Maintained the safe and sanitary work conditions throughout the department in compliance with applicable health and safety codes. Summary : High energy Assistant Team Leader IV with 27 years of experience in the Manufacturing domain, able to meet deadlines. Strong organizational and communication skills. Equally effective working on self-managed projects and as a team member. Advanced into various positions including assembly, weld, paint, bumper paint, vehicle quality, and material services. Trained new hires and current employees in new processes in multiple departments in various roles. Acted as a representative and mentor for associates as a member of the safety committee. Knowledgeable of and operated a variety of machines in all areas of productions. Accurately entered information into various databases, conveyed concerns to suppliers and associates. Created reports daily tracked data, trouble reports, team schedules and parts inventory control reports. As a quality inspector worked to improved quality and streamline operations. Operated inventory control systems to guarantee on-time parts delivery, via automated guided robots. Key associate during production to resolve issues and help associates maintain line speed. Objective : Assistant Team Leader with 4 plus years of experience is seeking to work in a role where my leadership skills, passion for people and overall zeal for life can be maximized. Provide the best level of service based on integrity, positive regard, professionalism and care. Assisting the Team Leader in all aspects of daily operations including profitability, expense control, buying, merchandising, labor, regulatory compliance, and special projects as assigned. Leading and developing the Team Members. Setting and achieving the highest standards of retail execution. Helping foster a positive work environment of outstanding teamwork, mutual respect, and exceptional morale. Partnering with the Team Leader to select, train, develop, mentor, motivate and counsel Team Members in a manner that builds and sustains a high-performance team and minimizes turnover. Modeling and delivering the outstanding customer service. Complying with all applicable regulations and guidelines when assisting customers in selecting products that best suit their needs. Following through on all customer questions, requests, and resolve concerns as needed. Maximizing the productivity and efficiency through proper scheduling. Summary : Resourceful and dedicated Assistant Team Leader II with 16 plus years of experience with motivational leadership, training, and employee supervision experience. 10 years in management and corrections. Hardworking and employs sound judgment. Delivering consecutive projects under deadline and in compliance with strict quality standards as a key player on 4-member framing team. Collaborating with teams to prepare building sites and support needs of project managers, supervisors, framers. Mentoring over 6 junior team members, providing guidance on proper techniques and safety. Consistently assuming the additional responsibilities and working in extended hours to meet project deadlines. Communicating with the Site Supervisors and team members to complete project objectives on schedule. Utilizing broad skills in construction to participate in excavation, site-preparation and various other processes. Negotiating pricing with suppliers that allowed for company savings of over $100,000. Assisting in the performance of inspection work, documentation and compilation of reports. Headline : Assistant Team Leader with 6 plus years of experience in the Retail domain is seeking to find employment with a stable company, that will allow for growth, both personally and professionally. Maintaining the food quality standards without variation, maintaining high standards of food safety and sanitation and maintaining all equipment in good working order. Supervising the prepared food team members to achieve maximum production and efficiency. Assisting the prepared foods Team Leader/Manager in controlling operating expenses. Organizing and maintained all food storage areas in accordance with health and safety requirements. Maintaining accurate department records to ensure documentation is available for review during various audits. Ensuring that proper procedures are being followed to meet the health and safety standards. Packaging, weighing, and displaying the food for grab and go case. Checking dates on products routinely. Suggestive selling with knowledge of products in the department. Sampling products for customers. Supervision of team members within an area or section of a department. Summary : Self-motivated Assistant Team Leader with 9 plus years of extensive management experience in retail and service industries. Detail-oriented team player dedicated to the highest standards of customer service. Directing the daily shifts in a fast-paced, sales-driven environment and guided a team to achieve desired goals in customer service, sales, safety, and sanitation. Responsible for maintaining a 90% average on mystery shop reports. Consulting with the Team Leader and buyer in all areas, including designing sales strategies, merchandising, inter- department communications and overseeing all aspects of front-of-house operations. Achieved an annual sales increase of 10% over the past three years while maintaining a labor budget of 400 hours or less and a 60% profit margin. Formed strategies to cut loss by 40% while the department maintained a budget of $20,000-22,000/week. Absorbed role as catering specialist and oversaw all catering functions during peak holiday season. Overseeing ordering of all non-perishable items including cleaning agents and store supplies. Assisted in the opening of Chicago store, including training and support of the new team, ordering, logistics, merchandising, signage and problem-solving. Implementing the daily checklists and objectives to give clear direction to the team and help developing new team members. Objective : Dedicated Assistant Team Leader with 3 years of experience, motivated to maintain customer satisfaction and contribute to the success of the company. Proven to establish a rapport with team members and potential customers. Reliable and driven with strong time management abilities. Collaboratively worked with store leadership to drive overall store financial performance in sales, profit, controlling budgets, meeting plans and controlling shrink. 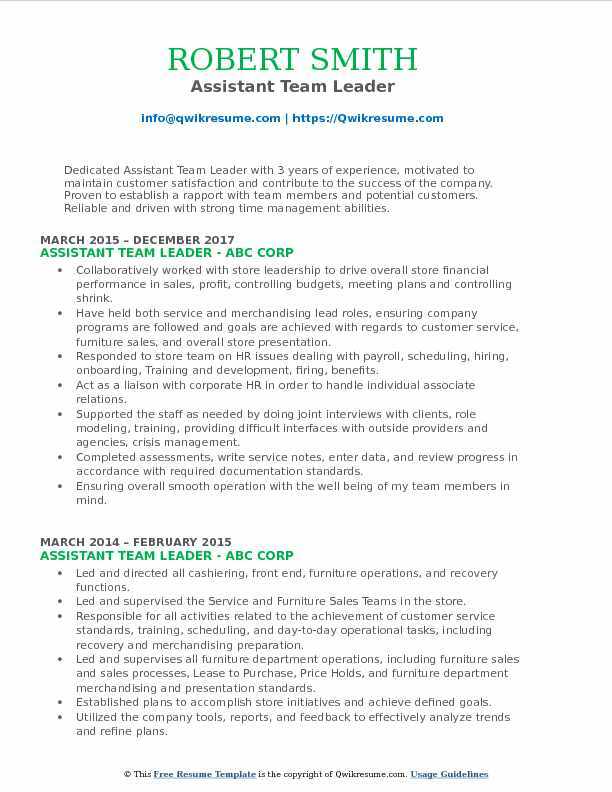 Have held both service and merchandising lead roles, ensuring company programs are followed and goals are achieved with regards to customer service, furniture sales, and overall store presentation. Responded to store team on HR issues dealing with payroll, scheduling, hiring, onboarding, Training and development, firing, benefits. Act as a liaison with corporate HR in order to handle individual associate relations. Supported the staff as needed by doing joint interviews with clients, role modeling, training, providing difficult interfaces with outside providers and agencies, crisis management. Completed assessments, write service notes, enter data, and review progress in accordance with required documentation standards. Ensuring overall smooth operation with the well being of my team members in mind. Ensuring excellent customer service as well as solving complaints to customers satisfaction. 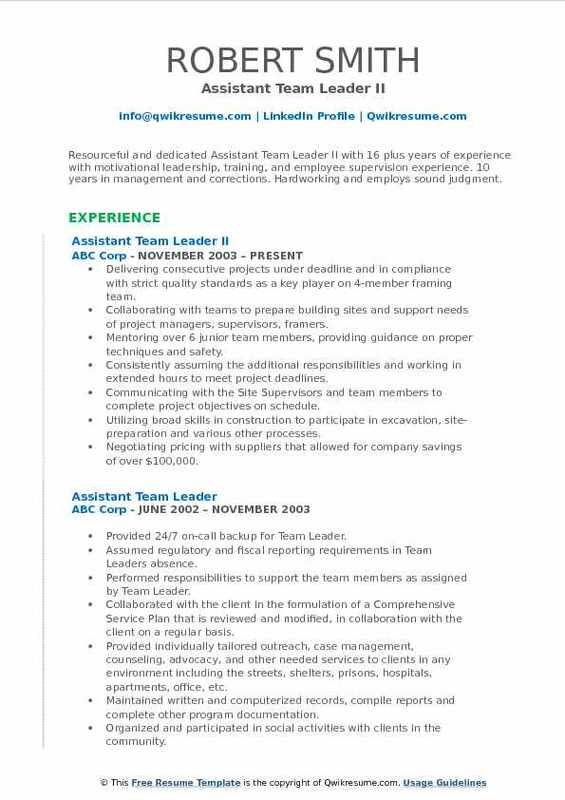 Summary : Assistant Team Leader III with 21 years of experience is seeking to obtain a position in a results-oriented company that seeks an ambitious and career conscious person, where acquired skills and education will be utilized toward growth and advancement. Skills : Excellent Organizational, Communication, Leadership, Presentation, And Interpersonal. Strong Decision-making And Problem Resolution, Demonstrated Visual Merchandising. Ability To Lift, Carry, Push 50 Pounds. Led and directed all cashiering, front end, furniture operations, and recovery functions. Maintained customer service standards, training, scheduling, and operational tasks. Interviewed, selected, hired, trained and performance evaluations of associates. Utilized company reports, tools and feedback to refine plans and accomplish goals. Served as Manager on duty including opening and closing the store. Provided leadership to ensure store merchandising, and lead and direct all activities related to truck unload, freight flow. Established plans to accomplish merchandising initiatives and achieve defined goals. Administered appropriate disciplinary action to associates, including recommendations for termination, in partnership with the store leadership and in accordance with company guidelines. Assisted with store scheduling and payroll processes on a daily and weekly basis. 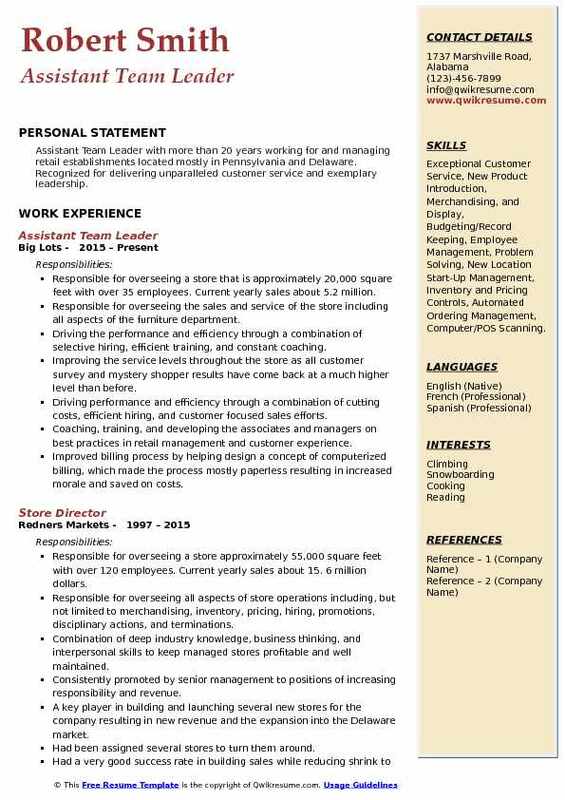 Summary : Assistant Team Leader with more than 20 years working for and managing retail establishments located mostly in Pennsylvania and Delaware. Recognized for delivering unparalleled customer service and exemplary leadership. 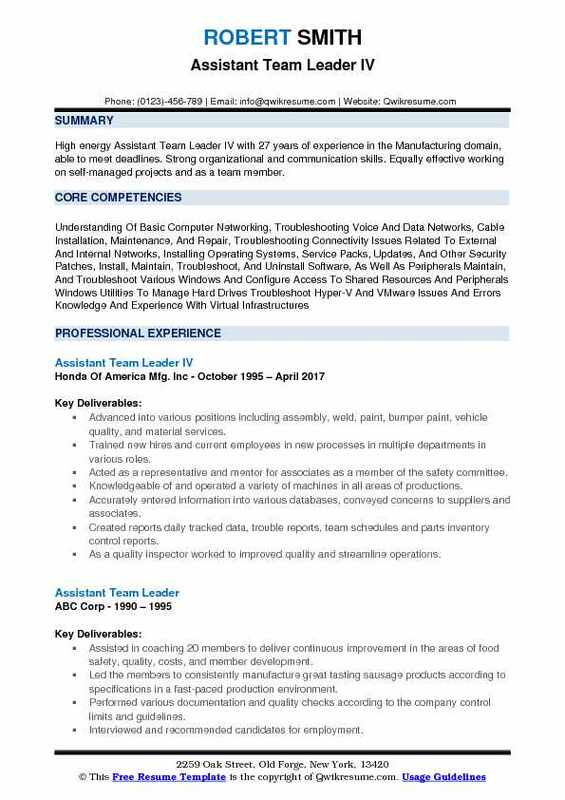 Skills : Exceptional Customer Service, New Product Introduction, Merchandising, and Display, Budgeting/Record Keeping, Employee Management, Problem Solving, New Location Start-Up Management, Inventory and Pricing Controls, Automated Ordering Management, Computer/POS Scanning. Responsible for overseeing a store that is approximately 20,000 square feet with over 35 employees. Current yearly sales about 5.2 million. Responsible for overseeing the sales and service of the store including all aspects of the furniture department. Driving the performance and efficiency through a combination of selective hiring, efficient training, and constant coaching. Improving the service levels throughout the store as all customer survey and mystery shopper results have come back at a much higher level than before. Driving performance and efficiency through a combination of cutting costs, efficient hiring, and customer focused sales efforts. Coaching, training, and developing the associates and managers on best practices in retail management and customer experience. Improved billing process by helping design a concept of computerized billing, which made the process mostly paperless resulting in increased morale and saved on costs. Responsible for meeting and exceeding company sales, labor, inventories, and bottom line dollar goals. 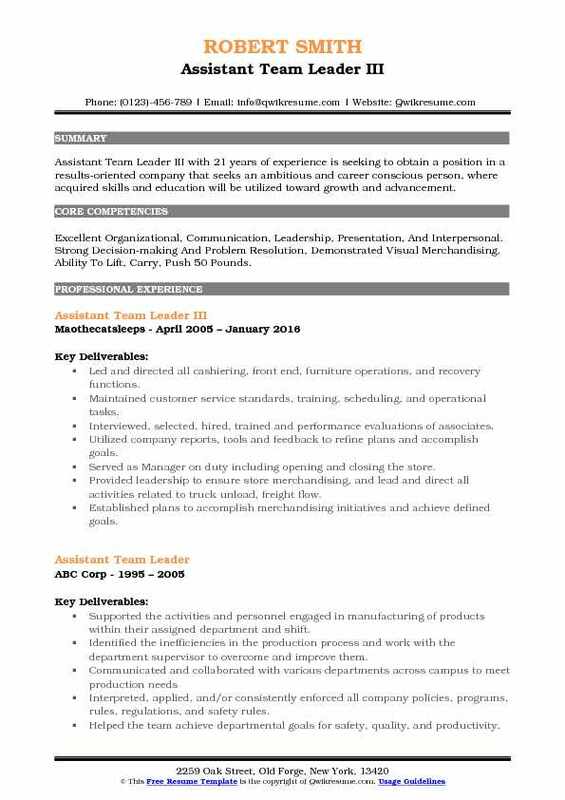 Objective : Conscientious, punctual, dependable Assistant Team Leader with 2 plus years of experience who is scrupulously vigilant about details and efficiency seeks employment as Team Leader. Extensive experience in Customer Service, Personnel Training and Supervision, Sales, Inventory Ordering and Management, Merchandising, and Marketing, with a demonstrated ability to provide each patron an enjoyable and satisfying experience through attentive customer care. Providing customers with quick, courteous service and developing the rapport with every pet parent in order to discover the needs of each one. Providing consultation and education in order to recommend products that fill the needs discussed. Coaching each associate so that they may be able to deliver proper consultation and education to their customers. Directing the associates to sources of information such as Bentley’s intranet site, whole dog journal, and other appropriate materials. Transition purchase requests to purchase orders by ensuring that each request contains items that are needed and by confirming that the quantities being ordered are suitable for anticipated sales levels. Monitoring the daily cash register balances and coach associates on the necessity to avoid any significant discrepancies. Investigating any substantial discrepancies to discern the cause and to establish guidelines to avoid such errors in the future. Verifying that Bentley’s merchandising, visual presentation, and cleanliness standards are upheld.